Delicious shell tarts (korzinochki) filled with walnuts and strawberry preserves. 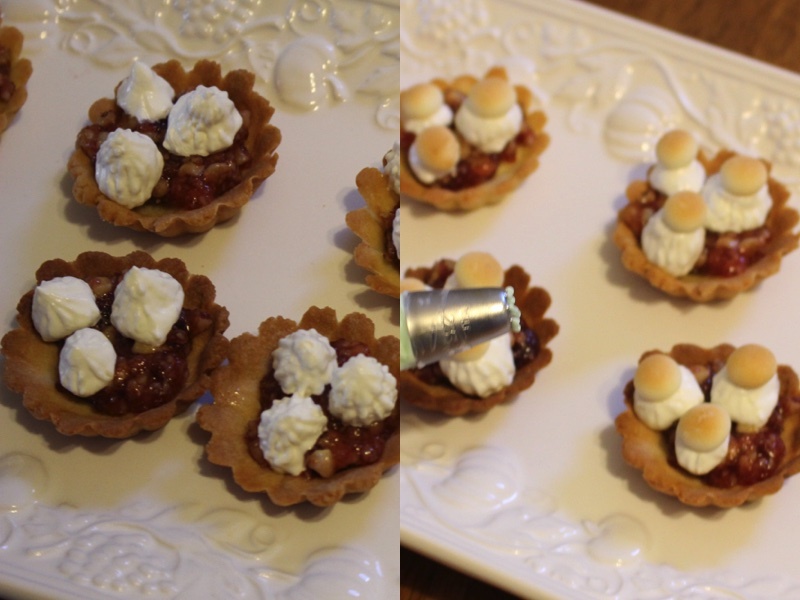 This is a very unique and creative way of making shell tarts. They don’t just look mouth watering but they are a very tasty and appetizing dessert that is quick and very easy to make even if you don’t bake on a daily basis. First you take sugar powder with cream cheese and mix together. 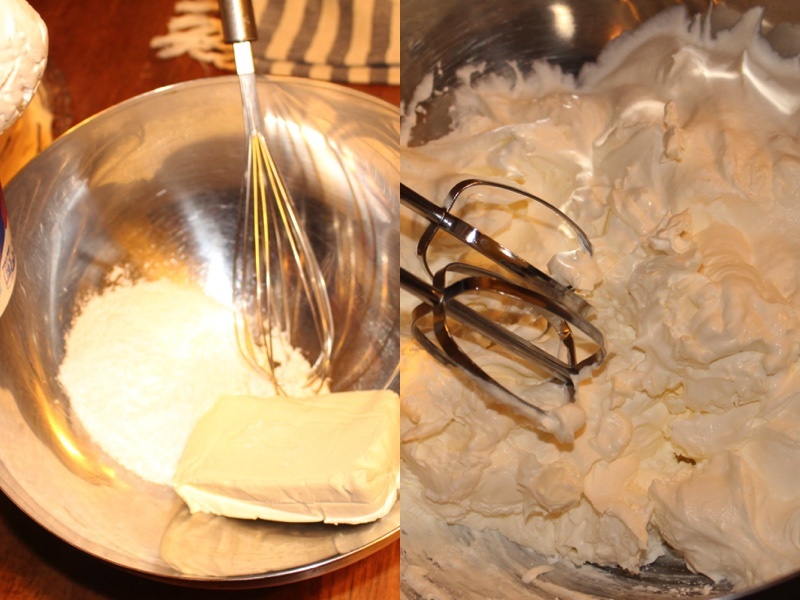 2) Then add cool whip and mix very well until it turns fluffy. 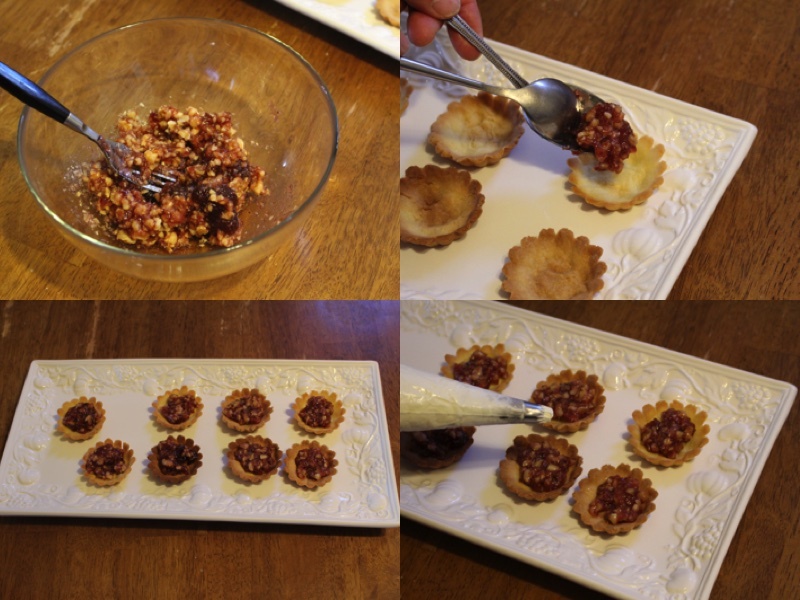 3) In a Medium size bowl break up into small pieces all of the walnuts and mix together with strawberry preserves. 4) Take a teaspoon of the mixture you just made and put into each of the tart shells (korzinochki). 5) Take the cream that you made and put into a cake decorating bag and squeeze out 3 oval looking shapes on top of each tart shells (korzinochki) which will be the bottoms of your mushrooms. 6) On top of each oval shape put a Bolo biscuit which makes the hat of the mushroom. You can buy them at Asian or Japanese stores. 7) Add green food coloring to a small portion of the cream and put into a cake decorating bag to make small grass next the mushrooms. 8) Enjoy these delicious shell tarts with your cup of coffee. Delicious shell tarts (korzinochki) filled with walnuts and strawberry preserves. 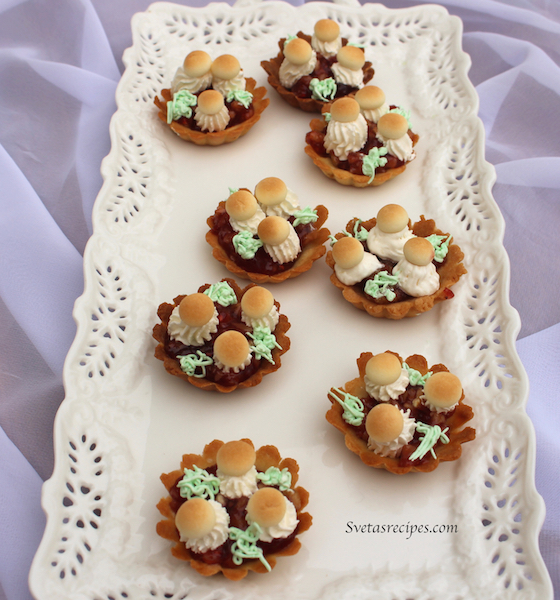 This is a very unique and creative way of making shell tarts. They don't just look mouth watering but they are a very tasty and appetizing dessert that is quick and very easy to make even if you don't bake on a daily basis. 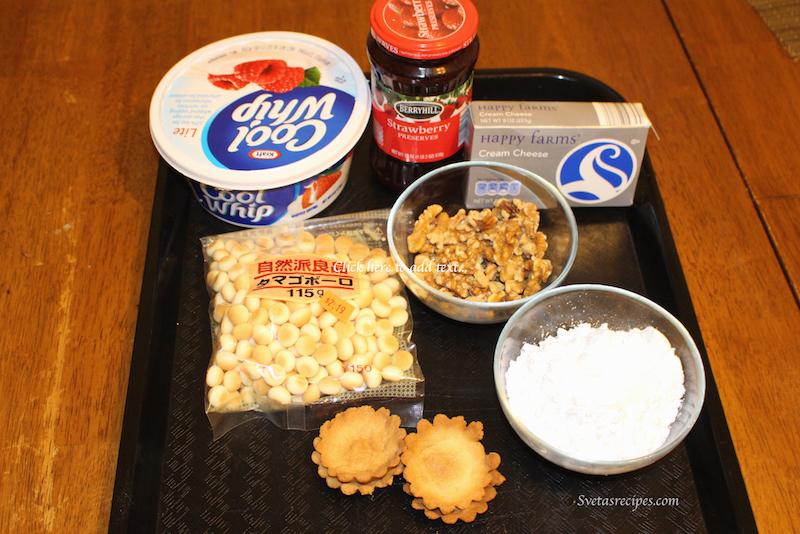 In a Medium size bowl break up into small pieces all of the walnuts and mix together with strawberry preserves. Take a teaspoon of the mixture you just made and put into each of the tart shells (korzinochki). Take the cream that you made and put into a cake decorating bag and squeeze out 3 oval looking shapes on top of each tart shells (korzinochki) which will be the bottoms of your mushrooms. On top of each oval shape put a Bolo biscuit which makes the hat of the mushroom. You can buy them at Asian or Japanese stores. Enjoy these delicious shell tarts with your cup of coffee.